Email: Send yokou an email. Private Message: Send yokou a private message. will be placed in the Hall of Fame for that challenge, but the person, who completes EVERY SINGLE ONE challenge, will be considered the U L T I M A T E P L A Y E R.
The list is fresh, so feel free to share your suggestions for new challenges and if you complete one, contact me via discord with proof prepared! Obtain 1,000,000.00$ having 0 RP all the time. 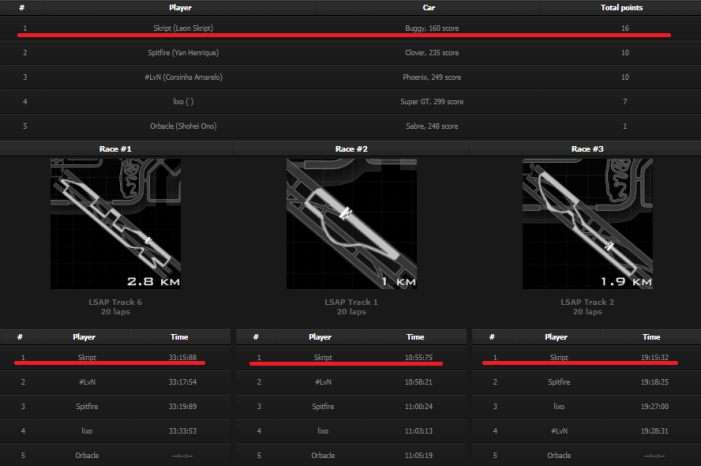 Obtain 1,000,000 RP on a new driver/account using ONLY ONE CAR, which will be the starter one. Destroy 15,000 Police Vehicles in a single pursuit. Obtain 4,000,000 drift points in a single slide. Unlock Locust 69 having 0 RP. Obtain 1,000,000 RP on a new driver/account with 0% race, duel and police pursuit ratio. Achieve 1,000 Diamond Hunt streak. 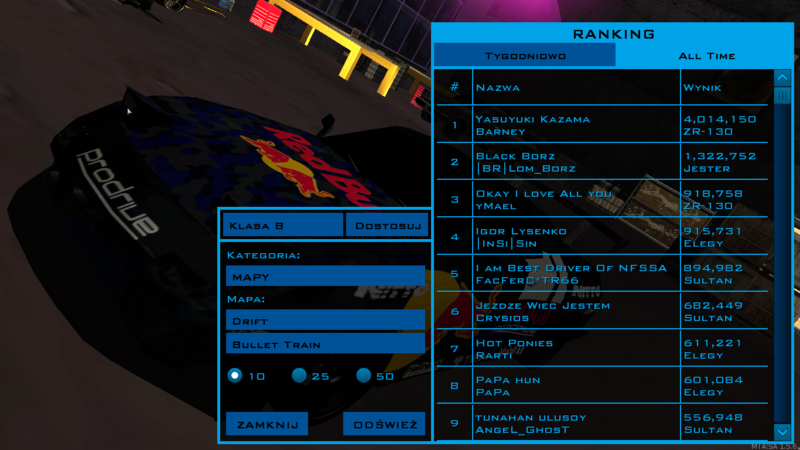 Finish a 150km LSAP URL, all races first with a stock Buggy. Option 1: Get Top of All Times on every Circuit and Sprint map for selected class. Option 2: Get Top of All Times on every selected race type map for every class. Be in a single pursuit for two days (48 hours). Your stats and experience with NFS:SA: Playing since 8 march 2016, 1,89kk rp, 68 days playtime. What do you do when someone starts spamming messages on chat? : Instant mute. What do you when someone starts insulting other players? : First i'm warning him, asking why is he doing this, and convincing him to stop. If that doesn't work, i'm muting him. And yes, that mute can be sometimes painful, depends on insults (racist, religion etc.). Do you have any experience (if yes, describe): Moderating some servers in other games (like minecraft :-)). Why do you want to join moderators team? (at least 100 words): Since some time, this rank has became my target to achieve on this server, literally a dream. I saw many things and I perfectly know what does this server need in terms of moderating, especially on chats. Sometimes it really gets out of control, and moderation really lacks of very active members like KomuH was once upon a time. Can't deny, that this server played a big role in my life, sounds funny, but it somehow changed it in good meaning. I spent tons of time here, meeting many people and staring to become one of the most known players. Now i want to help as much as i can to improve the server, making it a friendly place for everybody, offering great knowledge, experience, activity and strong hand moderation. Hello, as in the subject, if you're using ENB series mod and your MTA crashes after alt+tab, here's the fix for that. Somebody may find this useful. 1. Go to your GTA San Andreas folder and find gta_sa.exe and proxy_sa. 3. Right click both files, go to Properties - Compalibity and set ''Run as administrator'' option on. 5. Now you have to write a command related to both files: mklink "(place of your GTA SA folder)\gta_sa.exe" "(place of your GTA SA folder)\(the gta_sa file you renamed).exe"
mklink "C:\Users\yokou\Desktop\GTA San Andreas\gta_sa.exe" "C:\Users\yokou\Desktop\GTA San Andreas\vodka.exe"
mklink "C:\Users\yokou\Desktop\GTA San Andreas\proxy_sa.exe" "C:\Users\yokou\Desktop\GTA San Andreas\amarena.exe"
6. Done! Run your MTA, connect to server and check if your game still crashes after alt+tab. This should completely remove, or at least decrease the number of crashes causet by alt+tabbing. Post your feedback below!